I’ve never made a white chocolate cherry muffin before but since I had the ingredients on hand I thought I’d get creative with fresh cherries. I am happy I did because they turned out so moist but not sugary like most commercial muffins. I enjoy making white muffins once in a while adding in fresh fruits that I have on hand. One of my favourite white muffins is the blueberry muffin and on occasion I splurge making chocolate chip muffins. Muffins have long since been a favourite as a breakfast muffin or even a snack muffin. I’m pretty sure many of you would rather reach for a muffin over a donut for breakfast but be careful as they are not all created equally in terms of calories and fat content. I find it’s not often though that we see a fresh cherry muffin at the shops and to be honest they should be because they are just as good as any other fruit muffin. A muffin, especially a white muffin is simply cake that you can eat with your hands. So when you think you are eating a healthy muffin just because it has fresh fruit or even bran in the mix take caution if you are on a special diet. I don’t have all the nutritional info on my white chocolate cherry muffin but if you want a snack once in a while it’s a nice change from your dark or milk chocolate treats. I was rounding up all the fruit in our refrigerator that needed using up and I found some cherries that needed some love. Since we announced we are having a baby eating on the run has been the norm. Eating healthy is a priority for my wife but when you are pregnant you don’t mind a treat here and there to satisfy those cravings. Since I have been so busy I wanted to create some easy to make muffins that wouldn’t keep me in the kitchen for too long which incorporated some freshness. I wanted to make something for my wife that would keep her happy and I know how much she loves cherries. Cherries have been a huge part of her diet ever since she was a child. She would often go with her family cherry picking on the weekends where they would pick boxes of cherries. Her parents would make all sorts of jams, cherry pies and even cherries soaked in liquor for those special occasions. Sure we have whole grain cereals, oatmeal, toast and other goodies to eat for breakfast but sometimes we like to grab a snack on the go or something quick to eat. We’ve made frequent trips to the hospital so instead of stopping off at the local coffee joint to be tempted by the smell of donuts and muffins we make our own to bring along with other fruits and nuts we can eat on the go. 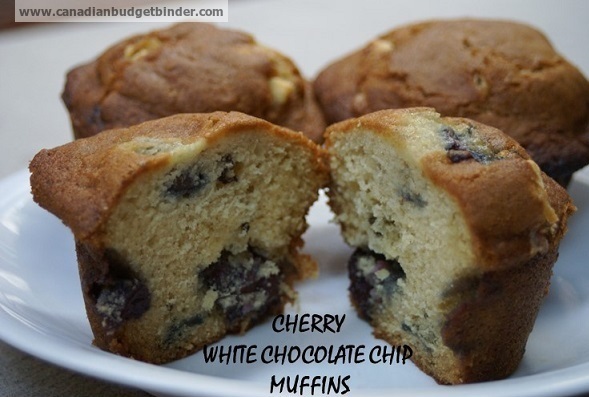 If you are not a fan of white chocolate you can easily make cherry muffins with no chocolate as this recipe is a basic white muffin recipe although I’ve added in some plain yogurt to keep it fluffy and moist. If you don’t like cherries, no fear add in any fruit you like and make this your signature fruit muffin. I like the cherry muffin myself especially that you can make it in one bowl although I would likely add a bit more of the almond extract to get more depth of flavour into the muffin. If you don’t fancy the almond cherry flavour you can eliminate the extract and keep it simple. Finding fresh cherry recipes is not always easy because for most people we stick to the tried and true recipes. I’ve shared a few of my delicious cherry recipes here like my Cherry Ricotta turnovers with marshmallow cream , Cherry Cheesecake, Greek yogurt stuffed Cherry Berry smoothie just to name a few. What is your favourite muffin to make? Muffin Baking Time varies depending on your oven. If you find the tops are browning too fast add a sheet of tin foil over the top to lightly cover while they cook through. Once your timer goes off use a toothpick to see if the cherry muffins are done baking by inserting the toothpick. If the toothpick comes out clean your cherry muffin is done. If you love fresh cherries then pack some of that organic goodness into this simple easy cherry muffin recipe. 2 cups of fresh cherries pitted and cut in half plus one tbsp of flour mixed in to coat so they don't sink to the bottom of your muffin. Fill each muffin cup to the top so you get nice big muffin tops. The muffin mix should not be runny, rather thicker. Bake in pre-heated oven for 20 mins or until a toothpick comes out clean. Don't over-bake your muffins or they will become dry. It’s not everyday that fresh cherries are available at the supermarket for a great price so take advantage of these seasonal cherries while you can before they go back up in price. I hope you enjoy these fresh fruit muffins stuffed with cherries and loaded with white chocolate chips. Looks really yummy going to have to make these soon. We had our brunch yesterday so I made my orange n carrot muffins and when they were still warm made an orange syrup to pour over the top then sprinkled with granulated sugar they were yummy of course only two left in the box I had better hide one for my brekky. The kids can have the pancakes and the cheese biscuits lol! LOL… this is all I’m going to be hearing from the wife once our baby is born lol. Yes… I remember all the time we spent in emergency when hubby first got sick and we were trying to figure out what the problem was and then a few times after that…It’s brutal and exhausting. Hope she feels better soon!!!! These look so good!!! I’ll be making them in a regular muffin tin so I’ll be getting 12 from the recipe. There’s 4 of us here so I need something that decides evenly by four!!! I still have some frozen cherries downstairs if memory serves me!! I like the idea of using different fruits in there too. Might be a way to use up some frozen fruit I have downstairs too!! Or if we got a really good deal on the bags of frozen fruits and blends at the store………..I’m fine with the almond flavouring, I use it all the time with anything cherry. I’ll have to see how the sales go for plain yogurt or sour cream, both would work depending on what’s available in the fridge. Might switch out the white chocolate too, wonder how dark would taste…besides yummy!!! I used to make muffins and quick breads a lot when hubby was working and the younger boy was in high school in Stratford. He couldn’t come home for lunch so I sent one with him. So between him and hubby there went 2-3 muffins in one shot!! I don’t think he ever bought his lunch all through high school…..unless it was on a school trip..maybe. Hope the Mrs is feeling better…..sending good thoughts your way for all!! !